Visual Studio, like any Integrated Development Environment, can host extensions for more specialist languages or development tasks. This sort of work is reasonably straightforward most of the time but occasionally you need functionality that isn't available in the APIs. Michal takes two examples, printing code in an editing window, and gaining access to the Visual Studio Notifications, and explains how to hack Visual Studio to get to the functionality. Microsoft Visual Studio is a great IDE (integrated development environment). It looks good from both the functional and design perspective, even though it is restricted by the need to maintain legacy aspects. It is so good that you will want to use it and extend it to meet your requirements. There is a long history to having an extensible IDE, probably originating from Alan Kay’s SmallTalk design. There is a range of reasons for wanting to add features: You might be tempted to create a custom color scheme, a tool to automate a mundane task or for moving files around. You might even need a complete support for a new programming language! When you are creating a Visual Studio plugin, you will most likely come across several frameworks such as native Visual Studio API, DTE automation object and Managed Extensibility Framework. You might even need to resort to using all of them at once to solve a more knotty problem. Some features of the IDE are not accessible from these frameworks, but you can always use them if you fully understand the caveats. I’ll mention these later in this article. To use these features, you first may need to take a look on how the creators of the IDE write their code or maybe even call their internal methods! Some of them are written in C++ but the most interesting bits are in .NET so you won’t need to resort to anything more complex than disassembling .NET assemblies. I do this disassembly work quite regularly while working on RevDeBug or while helping other developers on the ExtendVS Gitter.im channel. I became convinced, after seeing questions and problems repeatedly reappearing on this channel, that I should write an article about how to tackle such issues. To illustrate how to do this in practice, I’ll use two of the example questions that keep cropping up on the Channel. 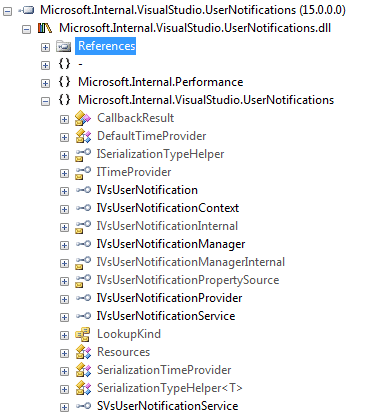 `Microsoft.VisualStudio.Services.UserNotifications.UserNotificationsWindow`. Using Snoop’s PowerShell tab I’ve also extracted the path to the containing assembly file. This was exactly, what I needed. Inside, I found the interfaces of notifications and a `SVsUserNotificationService` class for extracting the service that manages them. I then started to prepare the sample code I needed to check whether it would actually work. I had to use the .NET Reflector Analyze function few more times to learn how those interfaces are actually used before I was confident enough to be able to come up with the working code listed below. It requires a reference to `Microsoft.Internal.VisualStudio.UserNotifications.dll` to run. The second case was a bit more tricky – how can we programmatically trigger the print code function from an opened editor. Although there is a method within the DTE automation that provides this functionality (https://msdn.microsoft.com/en-us/library/envdte.document.printout.aspx), it doesn’t seem to work in newer versions of Visual Studio. Because the printing feature works just fine via the good old Ctrl-P shortcut, I wanted to give it a try and check whether it is possible to run it directly from code (and obviously not by emitting Ctrl+P keystroke). This time around I didn’t have a good starting point within Visual Studio, so I just loaded all VS private assemblies and looked for anything containing `print` in it. 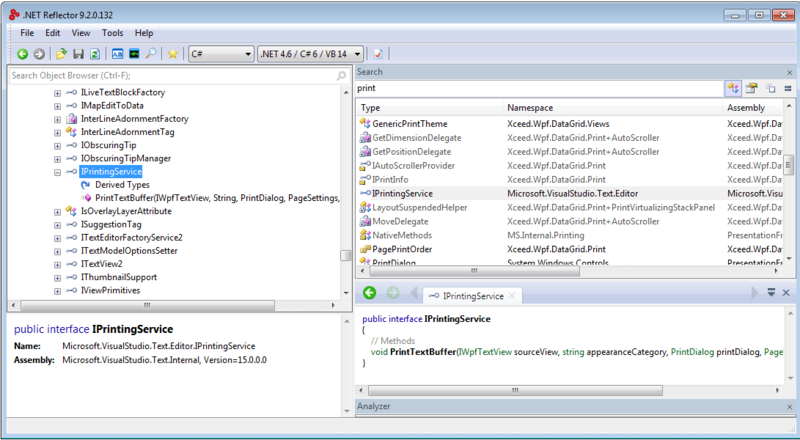 The PrintingClient class was responsible for providing everything that is needed to print a single code view represented by an IWpfTextView interface. With this knowledge, I could then try to write my own code and create an instance of this type. 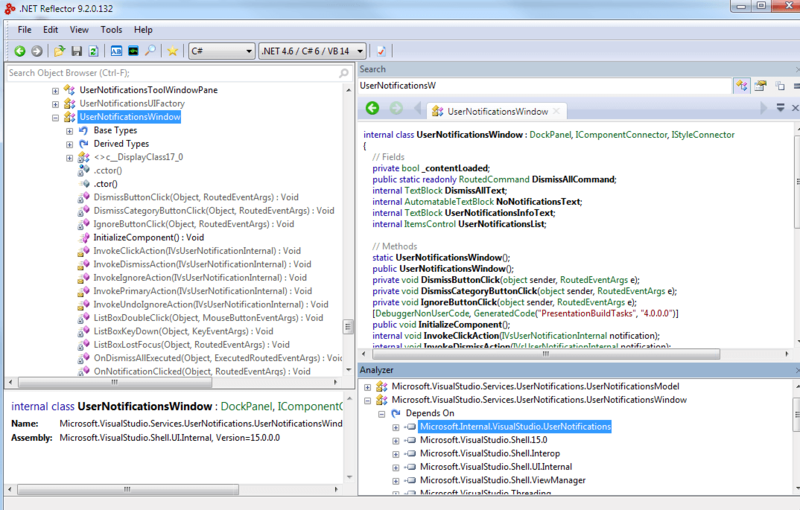 I could also check how exactly it is used within the Visual Studio. Another look at the `Analyze` tool via the `Instantiated By` option drove me to `SimpleTextViewWindow`. This class initializes the PrintingClient when it receives a proper command like “Print” or “PageSetup”. from a user in the InnerExec method, This couldn’t be better. If only this object was available for each code file that can be printed in the Visual Studio, I would be able to use reflection to invoke methods on the `PrintingClient`. When I rechecked the class declaration, I noticed that this class implements the `IVsTextView`. I decided to take a gamble that all printable text views which are returned from IVsTextManager.GetActiveView() are actually objects of the `SimpleTextViewWindow` type (https://msdn.microsoft.com/en-us/library/microsoft.visualstudio.textmanager.interop.ivstextmanager.aspx). It was worthwhile to give it a shot, especially because I hadn’t found any other class that would use the PrintingClient. I also assumed, that if the `IVsTextView` isn’t an instance of a `SimpleTextViewWindow` type, then we wouldn’t be able to use its print functionality anyway. Based on the knowledge I‘d gathered, I could then start preparing an exploratory method you can see below. As the PrintClient property that we need to access is not visible publicly, I resorted to obtaining its reference with the use of Reflection API. To run the code, you will need a reference to the `Microsoft.VisualStudio.Editor.Implementation.dll` library, because it uses the `Assembly.GetType` call for extracting types via reflection. It might be easily replaced with a proper assembly-qualified name for the needed types, but it was a quick hack just to get it running. When run from a Visual Studio plugin, the code above will trigger the printing facilities of Visual Studio, which was what I was striving for. PublicAssemblies – public and in almost all cases well documented interfaces. If possible, rely on those. 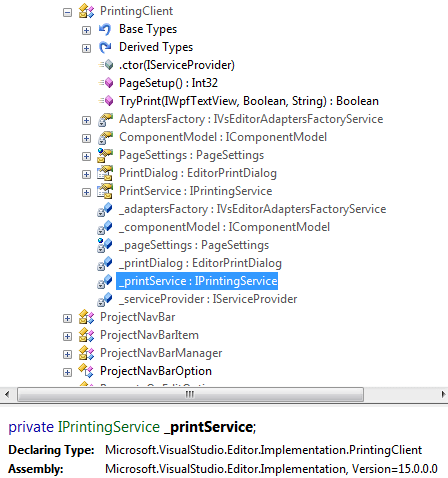 PrivateAssemblies – Those change between Visual Studio versions and they lack documentation. Many of the public methods execute code from it.